Hollywood is at it again with their vicious Trump-hate. This time, in a Tweet that brought outrage over its content, they hinted at assassinating President Trump. 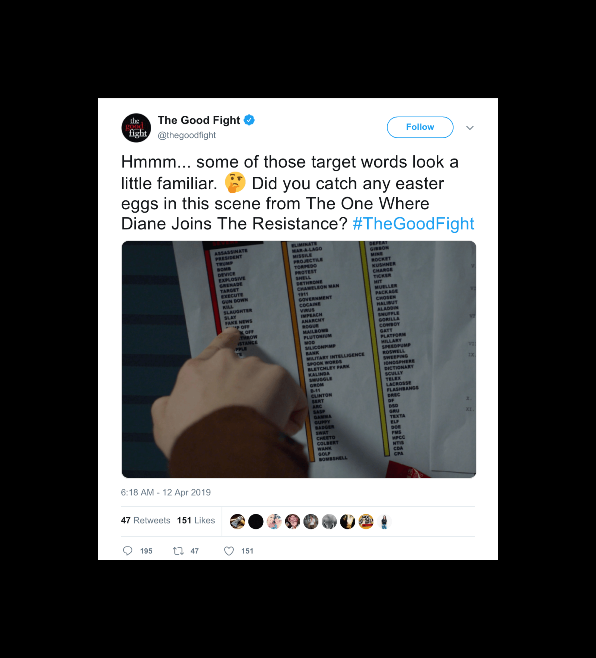 The CBS Drama “The Good Fight” tweeted a picture of part of the plot to the show, and they knew it would gather outrage. It was what they were hoping for in the first place. More outrage, more publicity. Last year, one of the characters of the show did the same thing- she said that “We need to assassinate the President.” The character of attorney Diane Lockhart, is a known Trump-hater. The character is played by actress Christine Baranski, someone Trump haters can relate to on a personal level. But is it a good idea to keep promoting this kind of idea? No. Despite the CBS political drama’s obsession with plot points that involve the impeachment or assassination of President Trump, The Good Fight co-creator Robert King claims these storylines are merely a satirical take on America’s current political climate. Oh yeah, it’s just “satire.” It’s just a “joke.” If their continual “jokes” manage to get the President killed, I hope they get prosecuted as accomplices. Every last one of them.